Long before Lin-Manuel Miranda’s name was synonymous with “Hamilton” he had already won 13 Tony Awards including Best Musical, Best Musical Score for his "In The Heights". It also won the 2009 Grammy Award for Best Musical Theatre Album that year. In 2008 “Alexander Hamilton: An American Musical” was still an idea in his head conceived and inspired by Ron Chernow’s biography of Alexander Hamilton founding father and first secretary of the treasury. In 2009 Alexander Hamilton’s likeness was then (and still is) a picture on our ten -dollar bill and Lin-Manuel Miranda was coveting awards for this earlier creation. Miranda wrote the music and lyrics to “In The Heights” with book by Quiara Alegria Hudes. This award winning musical is now making its Moonlight’s debut on the outdoor stage in Vista through Sept. 13th. “In The Heights” director James Vasquez and his highly charged and passionate cast take us through the trials and tribulations of real people living their dream or aspiring to achieve them over a period of three days. Much of what happens in the time frame as told to us through dance as in Hip Hop, Jazz, Salsa, Mambo, Rap is added to an amazing chorus of voices and an outstanding and the highly talented ensemble and first rate music coming from the pit. There is almost no time to take a breath in this vibrant and dazzling production, but shout outs are still in order. The production shines in every category. Aside from the fabulous dancing (credit choreographer Carlos Mendoza), the amazing voices and high voltage enthusiasm, the plot reads like a soap opera, mostly germane to that particular niche in Washington Heights, yet not unlike the stories in other small ethnic communities throughout the US. 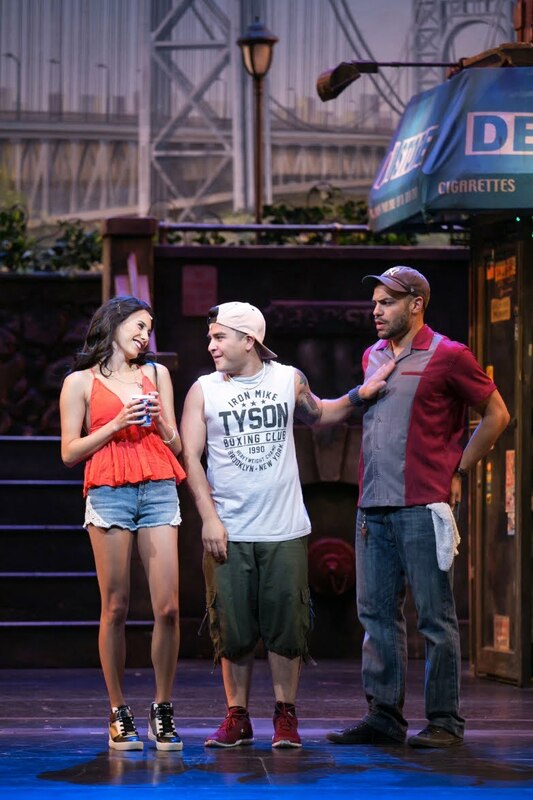 Most everyone ‘in the heights’ is either first or second generation whose families came here from the Dominican Republic, Puerto Rico, Cuba and or other Latin American countries. Everyone is struggling to make a living; some strive to move up the social ladder while others want to move out and back to their native lands. All are survivors. 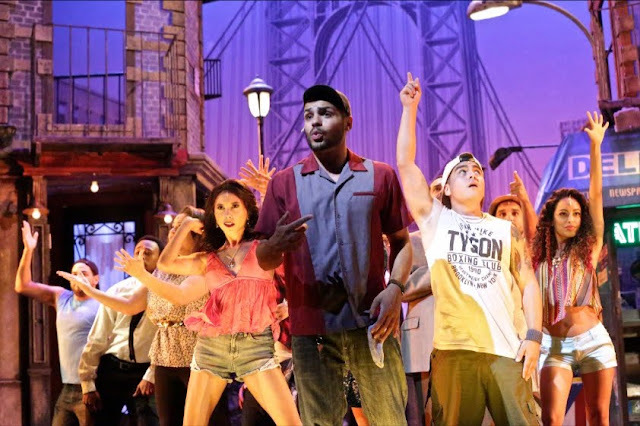 William Cooper Howell’s Usnavi character is central to the goings and comings of those in his intimate Washington Heights’ barrio community of New York. As a talented dancer, rapper and mild mannered adopted grandson to his Abuela, both from the Dominican Republic, he is a perfect choice. 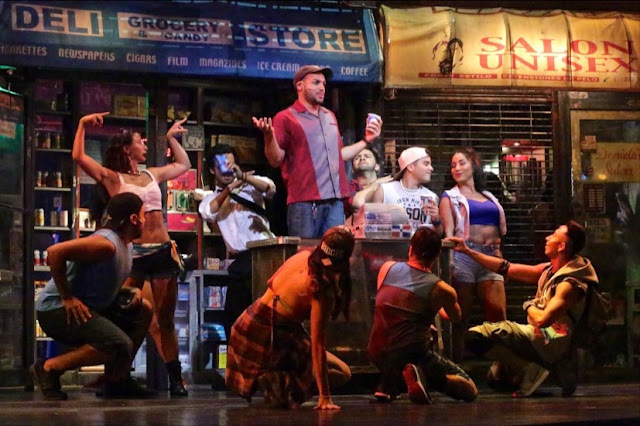 Usnavi owns a bodega smack dab in the middle of all the other businesses (a Unisex Hair Salon, Rosario’s Taxi, car and Limousine rental and the Deli that belongs to him). Upstairs above the businesses house the good folks in the neighborhood, in particular Abuela Claudia (Samara Otero), everyone’s grandmother and collector of memories. Usnavi’s love interest, Vanessa (Michelle Cabinian, full of life and a gorgeous dancer) is also a tenant. Vanessa works in the next-door hair salon and is always in need of money because she takes care of her alcoholic mother. Sonny (Nicholas Alexander) Usnavi’s savvy cousin and jokester plays cupid arranging a date for Vanessa and Usnavi. 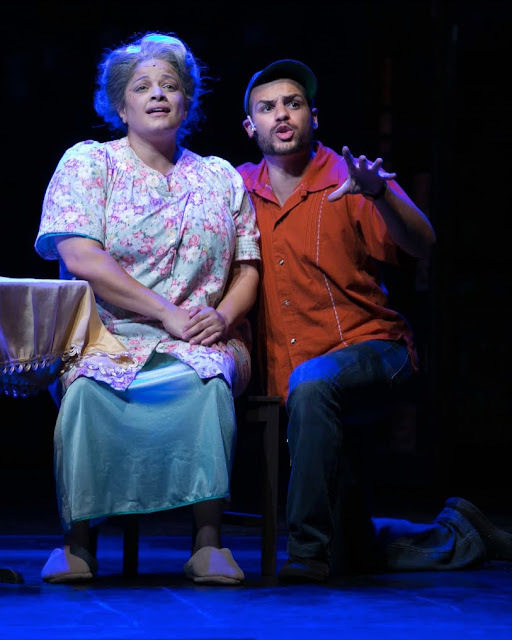 Abuella and Usnavi share a dream of returning to the Dominican Republic. Vanessa just wants out. Nina Rosario (Caitlyn Calfas) is the first generation to the leave the community for college with a scholarship to Stanford. She’s overwhelmed by holding down two jobs to make ends meet and keeping up with her grades and as a result loses her scholarship. She returns to The Heights much to the surprise, pleasure and later chagrin of her parents. Her story also unfolds in high- energy drama as the now grown daughter has a love interest, Benny (Carleton Buford). Benny has worked in the family business as a taxi dispatcher in Rosario’s Taxi and Car Rental since he was a youngster. He was treated as family by Nina’s parents Kevin and Camila (Rudy Martinez and Amber–Sky Skipps both convincing and in fine voice as long time marriage partners and loving parents.) but now that he’s interested in their daughter, it’s ixnay. Carla and Daniela (Nadia Guevara and Marlene Montes) are the two hairdresser/gossips and Graffiti Pete (Sebastian Montenegro), Sonny’s friend who specializes in spraying the neighborhood with graffiti round out a goodly number of those whose stories are played out. And not to be forgotten, Piragua Guy (a terrific Jonathan Arana “Piragua’) from Cuba is the guy who pushes his snow cone cart through the Heights every day. He too hopes to make it big one day. Samara Otero is soft, nurturing and convincing as Abuella Claudia singing “Paciena Y Fe” (Patience and Faith) and ‘Hundreds of Stories”. She also convinces as the elderly grandmother with wise words for the younger generation. Nadia Guevara and Marlene Montes both great dancers are standouts. Nicholas Alexander and Carleton Buford as Sonny and Benny who both come from opposite ends of the spectrum and add significantly to the overall look and feel of this magnetic force called “In The Heights”. They bring another dimension as the 'younger generation' that will one day carry the flags of their elders. Once Caitlyn Calfas settled into the role of Nina on opening night, she too added to the scenery of one pulled in two directions. Her decision to stay and blend in with the landscape or go off and make it outside the gates of her own barrio plays significantly into todays dialogue about who and what makes an American. While the musical is set in the 80’s it’s more relevant today than one can imagine. There are over twenty plus performers in this show and not one weak spot. However I will take some exception with Jim Zadia’s sound design and suggest the volume be turned down a bit. The live music (Elan McMahan) comes from her thirteen-piece band in the pit just below the stage. McMahn Musical Director and conductor, a solid fixture at Moonlight is making her 53rd production as Musical Director. Congratulations! 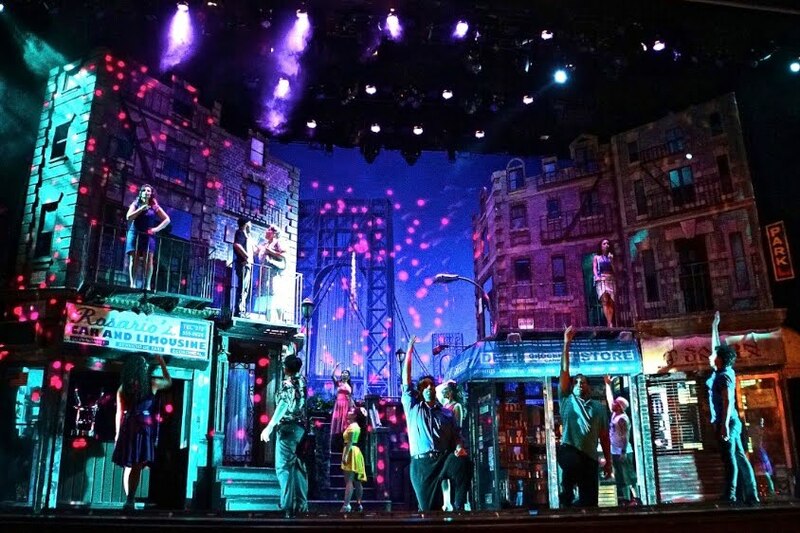 The realistic looking set (Anna Louizos) with towering tenement houses dwarfed by George Washington Bridge looming in the background are from the original Broadway show. Lighting designer Jean-Yves Tessier’ living color stage looks perfect against the outdoor evening’s sky in Vista. Costumes by Renetta Lloyd add to the overall and authentic look of the place called Washington Heights. It’s been a banner year for Moonlight Stage Productions. 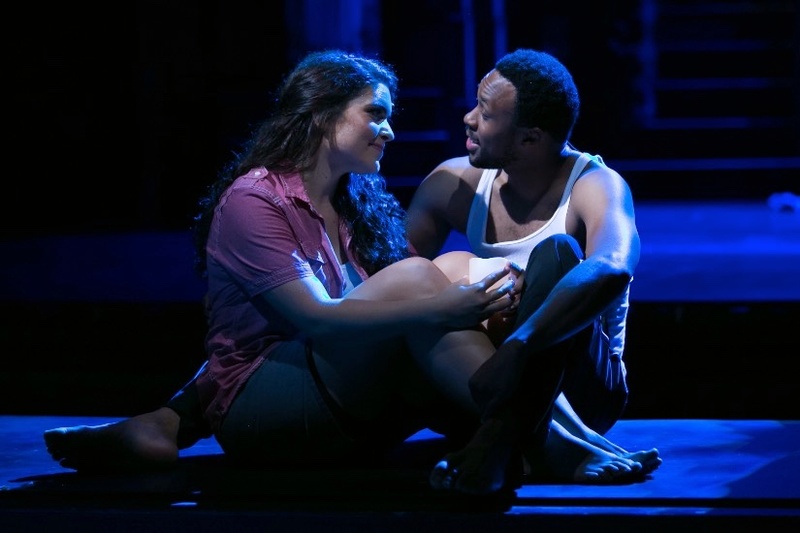 Closing out with “In The Heights” at the very height of the ongoing debate over DACA, stifling immigration laws and a horrific rise in race relations might serve as another topic of conversation for those who don’t see the similarities. To those whose ancestors came to this country and endured the same hardships and lived in all the heights or barrios or slums then and are facing still now, thank goodness for voices like Lin- Manuel Miranda. This is a two thumbs up show.